L has been really looking forward to the new Marvel film; Captain America: Civil War coming out. 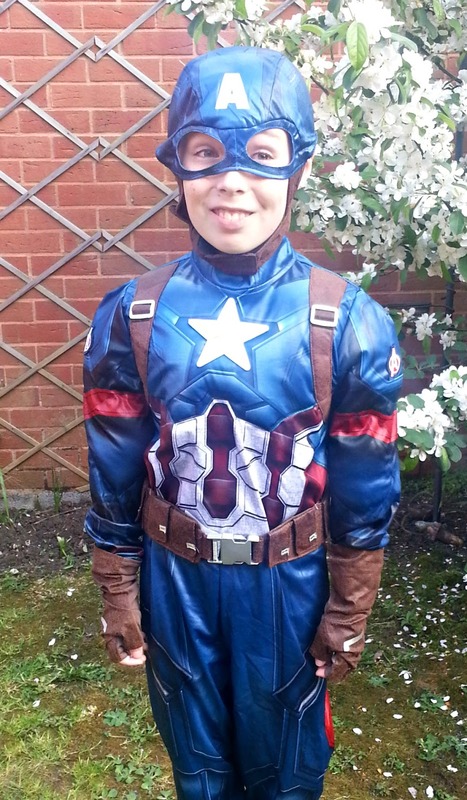 He's a huge fan of Marvel and likes to go to the cinema to see the new ones when they come out, ideally in costume. For this film there were two camps; #TeamIronMan and #TeamCap and L was unsure which side he wanted to be on. As he had already been to the cinema twice in his Iron Man suit, he was quite keen to try a Captain America look and, lucky for him, The Disney Store were able to send him one to review, which was really helpful! Being a big fan of costumes, he considers himself a bit of an expert and was very keen to list all the reasons why this was the best costume he had ever worn. The first thing I noticed about the costume is that it is made from a much stronger material than some others we've tried. I had to buy a Stormtrooper costume from another shop in a hurry yesterday (not that I forgot about 'dress as something to do with space' day at school, or anything! *ahem*) The material was so thin, you could see right through it. It may have been cheaper, but I really can't see it lasting and it didn't look very comfortable at all. The thicker material not only gives reassurance that it will last longer, it also gives it a much better shape, so it fits properly and isn't baggy and shapeless. 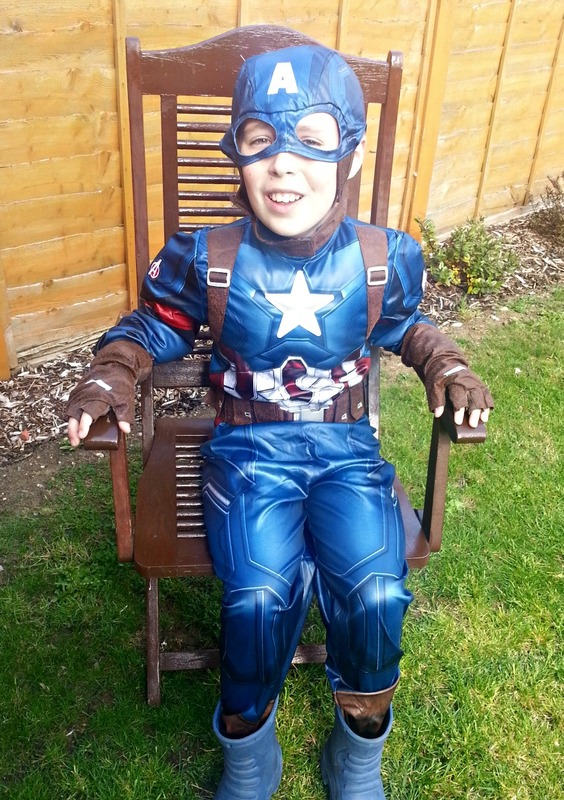 L said that his Captain America costume fitted really well and it certainly looked very comfortable. He even looked comfortable in it sitting down, which is a good test for any one piece costume! He told me that it felt more realistic, due to the 3D aspects to it. There is certainly a lot of attention to detail. The costume features braces and a belt that feel like suede. The belt has an authentic looking buckle, which you can undo easily. The accessories; gloves and hat, also have a contrasting suede-like material, which really adds an element of authenticity to the costume. It's these thoughtful touches that really sets this costume apart from its rivals. The sizing is generous and well proportioned. L has not long turned ten and is of average height for his age. This costume, in a 9-10 fitted him perfectly. At £29.99, this may be a bit of an investment, but I think it stands a good chance of lasting a bit longer than most and you can't put a price on comfort, particularly when they want to wear it all the time! Item provided by The Disney Store, for our honest opinion! he looks great! Does he get you to dress up too, whenn you go??!! He made me wear the hat thing! I think it was more so he wouldn't lose it though!